Dulce de leche is something I used to think of as more of a flavor – one introduced to me by Haagen Dazs ice cream. I knew there was more to it than that, but I had never had a real dulce de leche sauce. Thanks to Alton Brown that all changed this past weekend. I was flipping channels and landed on Alton’s milk episode. Always interested in all things dairy – especially if those things have anything to do with aged, bacteria-laden dairy – I stopped and watched. While this episode had little to do with cheese, it did reveal a few secrets of tres leches cake and, the subject of this post, dulche de leche. I couldn’t resist the simple preparation. Milk, sugar, vanilla and baking soda combined and then left to reduce. It takes a good amount of time for the milk to cook down to a rich caramel-colored sauce, but most of that time you can totally ignore it. Just let it go (aside from the occasional stir) and two to three hours later you’ll be left with a generous cup of dulche de leche that will last up to a month in the refrigerator. I use vanilla bean paste in place of a vanilla bean. If you stick with Alton’s use of a split vanilla bean, you need to remove the bean after one hour of cooking or it will impart a bad taste. 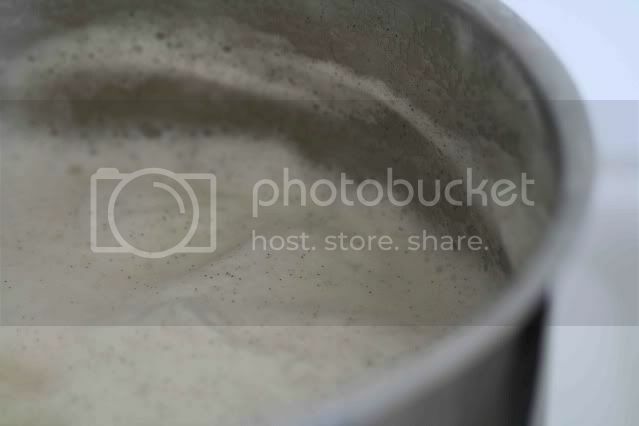 Combine the milk, sugar and vanilla bean paste in a large saucepan over medium heat. Once the sugar is completely dissolved, stir in the baking soda. Reduce the heat to low to maintain a bare simmer and let the mixture cook, uncovered, for 2 1/2 – 3 hours. Stir occasionally, being careful not to reincorporate the foam that forms on top of the mixture (you will strain this off at the end). 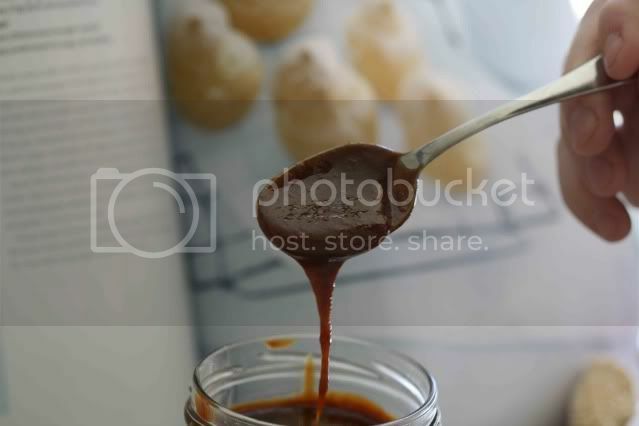 After 2 1/2 – 3 hours, when the sauce is a deep-brown and you have just a bit more than a cup left, strain through a fine mesh strainer into a clean jar. Store in the refrigerator for up to a month. Thank you for reminding me that I need to try fixing dulce de leche immediately! It looks soooo heavenly... I like your idea of using vanilla bean paste! I confess I've never seen vanilla bean paste before, but it sounds fabulous - where do you find yours? Wow, there must be something in the air. I need to get some dulce de leche for a recipe I'm dying to try and have had trouble finding it in a store (strange--in SF--but whatever). I just started to think maybe I could make it...and hers is your timely post. Awesome. Thanks for visiting chiknpastry :). Love the dulce de leche, AND the carrot cake pancakes - I made those same ones this weekend for guests and we devoured them! you can't always tell it's from cooking light, that's for sure! Great photos. I didn't realize there were so few ingredients in this. I had never heard about this method of making dulce de leche. The addition of vanilla bean makes htis one sound incredible. 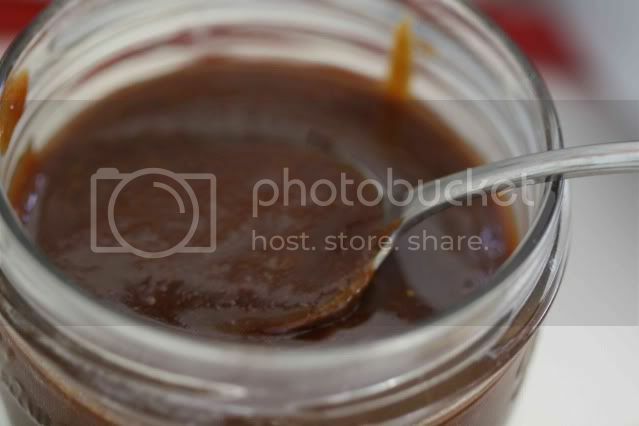 Anything that involves dulce de leche is perfection for me - I can never resist its charms. Delicious!